It’s funny how kids are all about equality and “fairness”, although only when tipped in their favor. If something was unfair to my brother or sister but I came out ahead of them, then it seemed perfectly fair to me. But, on the other hand, if they got more purple jelly beans in their Easter basket than I did, then that simply wasn’t fair. Or if they were invited to a sleepover at a mutual friend’s house and I wasn’t – not fair. Or my sister got the bed that was on the side of the room I wanted – just not fair. Or they got to sit next to Grandma at the dinner table when she came to visit – so not fair. Another thing that wasn’t fair? Ordering an appetizer (which always seemed to be designed for 4 people) and wondering how we were going to fairly divide it between our family of 5. I’m sure my parents were oblivious to the looks my brother and sister and I would give each other, each of us thinking, “there’s only 8 mozzarella sticks, so after we each get one, who gets the remaining three or do we have to split them up, and how do we fairly do that since one person might get a whole one and everyone else will just get half?”. Oh, the silliness. But mozzarella sticks in a restaurant were a rare treat for our family, since most of our meals out were at the “kids eat free” fish or steak restaurants where the food got a little repetitive, so you might understand our anxiety over fried, gooey mozzarella and warm marinara sauce. 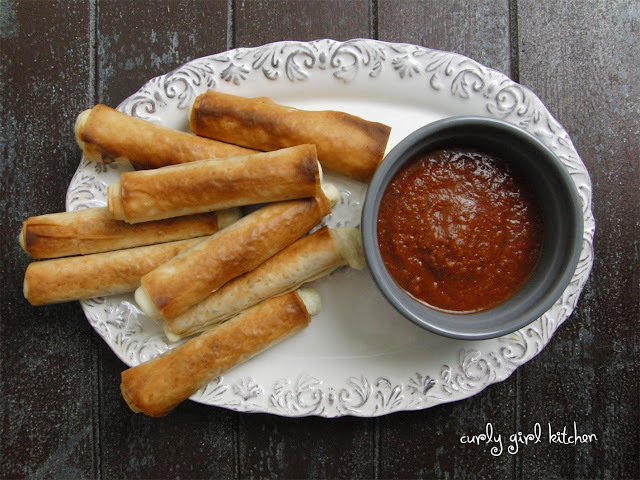 Several times over the past year, I’ve tried unsuccessfully to make mozzarella sticks. The first time, we were making beer-battered onion rings and jalapenos, and I thought, why not throw in a few pieces of string cheese, too? Much to my disappointment, the cheese exploded in the hot oil and there was not much left inside the shell of beer batter. The next time, more recently, I tried a baked version, rolling them in a little flour, then dipping in milk and coating them in seasoned Panko. But before the Panko had a chance to brown, the cheese was melting all over the place, dripping down through the wire rack I’d placed them on. The key step I later realized I was missing was to freeze the cheese first, so that it wouldn’t melt and/or explode. The wire rack in the oven didn’t help, either. Older and wiser, I decided to try baking them again, because I really wanted to make a healthy version where I could eat a few and not feel heavy and full. So instead of breading the cheese, this time I rolled each frozen stick up in a single sheet of fillo dough which is very light in fat and calories but has a wonderful crunch when baked, that I’d sprayed lightly with olive oil and seasoned with garlic powder, cayenne pepper and dried oregano. And as you can see, they baked so beautifully brown and crispy, with the cheese melting and oozing out the ends. For an at-home version that is easy and healthy, I don’t think these could be any better. It seemed to be a mozzarella-themed evening, and after the success of the baked mozzarella sticks, we made margarita pizza, one of my all-time favorite types of pizza. I have tried and tried to make a thin and cracker-crispy pizza dough, and have finally come up with a recipe that we’ll be sticking with. The recipe makes enough for two pizzas, so we always freeze half for another time. The key is in rolling the dough out extremely thin, pricking it all over so it doesn’t bubble up, heating the oven as hot as it will go, using a very hot pizza stone, and prebaking the crust for just a few minutes before adding the toppings. 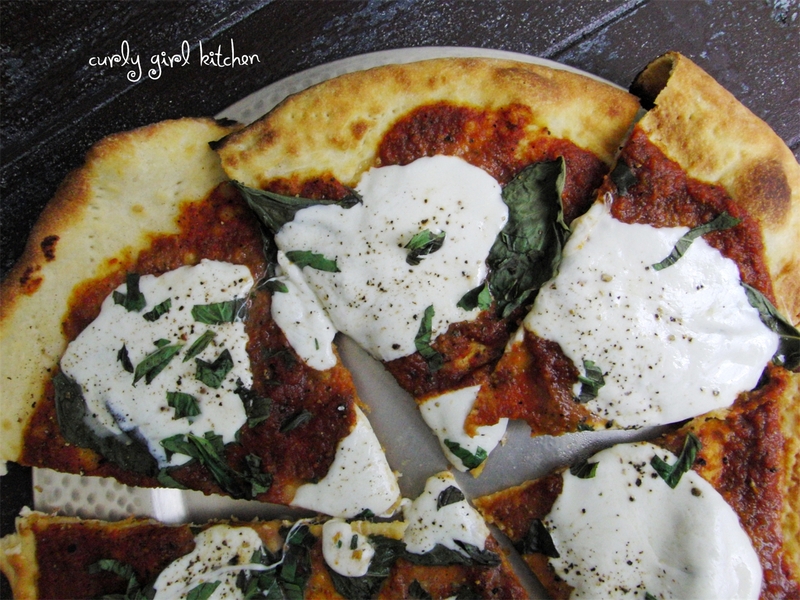 Margarita pizza is wonderful in its simplicity of just a little sauce or fresh tomatoes, olive oil, basil and mozzarella. 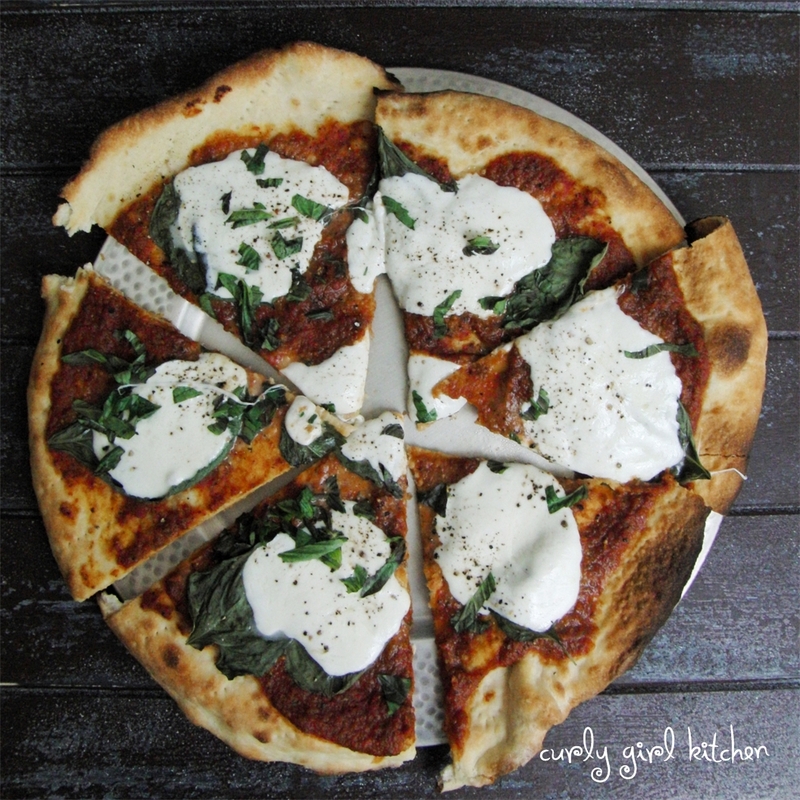 My very first blog post almost two years ago was for margarita pizza, but I thought this blog deserved a better thin crust recipe to go along with it. Pour the water into the bowl of your stand mixer and sprinkle the yeast over the water. Let stand for about 10 minutes until foamy. Add the olive oil. Combine the dry ingredients and add half to the mixing bowl. With the dough hook attachment, mix on low, gradually adding the rest of the dry ingredients. Mix for a few minutes just until all the flour is incorporated and a stiff dough ball forms; add a little more warm water if needed. If using the dough right away, place in a greased bowl covered with plastic wrap; set in a warm place and let rise until doubled in size, about 1 - 1 1/2 hours. Preheat the oven to 550, with a pizza stone on the center rack, for 20-30 minutes so the stone is very hot. On a lightly floured surface, roll out the dough the same size as your pizza stone. Thoroughly prick the dough all over with a fork (this is called "docking the dough", to prevent it from bubbling up). Carefully take the pizza stone out of the oven and set it on your stove. Quickly transfer the dough to the pizza stone and brush it lightly all over with olive oil. Return the stone to the oven and prebake the crust for 4-5 minutes until it is just beginning to get browned and crisp. Take the stone out of the oven and set on your stove, then quickly spread the sauce or tomatoes over the crust, then top with the fresh basil leaves and mozzarella slices. Return to the oven and bake for a couple more minutes, just until the cheese is melted. Dough recipe yields enough for 2 pizzas, and topping amounts listed above are enough for 1 pizza. Note: Before assembling and baking these, you must freeze the mozzarella for two hours. This will prevent it from melting in the oven before the fillo has a chance to brown. Preheat the oven to 350. Line a baking sheet with foil and spray with non-stick spray. Lay a single sheet of fillo on a cutting board and cover the remaining fillo sheets with a towel so they don't dry out. Fold the sheet in half, from one short side to the other; you will now have a long piece of fillo that is the same width as the length of the cheese. Spray the fillo lightly with olive oil spray, then sprinkle with garlic powder, oregano and cayenne, or any other seasoning you'd like to use. Place a frozen mozzarella stick at one end of the fillo and roll it up. Spray the outside of the roll with a little more olive oil spray and place seam side down on the baking sheet. Repeat with the remaining fillo sheets and mozzarella sticks. Bake at 350 for 12 minutes, until the fillo is a very pale golden brown and you can see the mozzarella just starting to ooze out the ends. Turn the broiler on and broil for 2-3 minutes to finish browning the fillo. 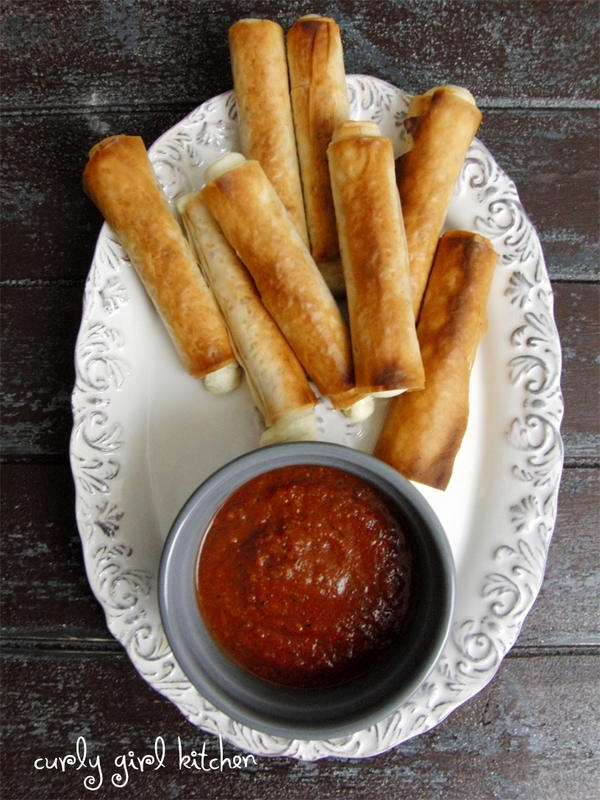 Serve immediately with warm marinara sauce. 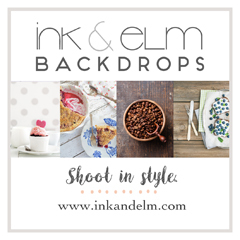 I invite you to enter add your blog and upload a recipe with a nice photo. 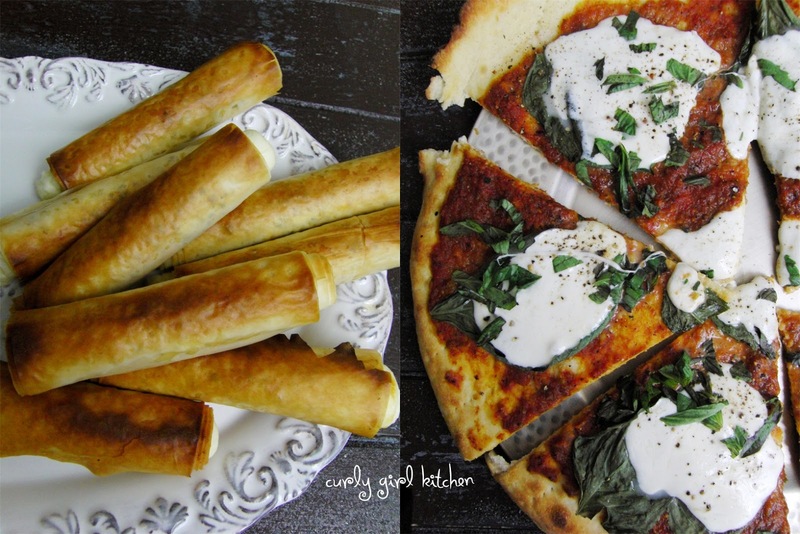 We would love that you participate with some recipe like this.Look Amazing! I always love this food, cheese sticks. Here, we usually fry it. However your pictures look very yummy, I have to try the bake one some time. Thanks a lot!